Rumina is a high school student, who dreams of having a pretty girl, but ends up finding himself speechless when confronted with them. 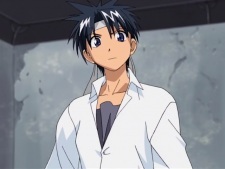 As the series begins, he is starting a new school year and wants to avoid continuing his reputation as a fighter. One day he encounters two strange girls who change his life forever. In an effort to protect the cute Ruri from harm, Rumina fights hard, but eventually loses. Ruri's powers of life revive him, and with new life comes the amazing ability to control wind powers. Rumina joins Chelsea in protecting Ruri and joins their battle in the Tokyo Underground.